Blue Winged Olives (Baetis) are popping on the Stone. We’ve been seeing a few tiny BWOs for the last week or so, but the hatch is getting thicker and the second wave of bigger bugs is starting. The majority are still in the 18-20 range, but some solid 16 bugs are coming out. If the wind isn’t blowing, fish are getting on them. The hatch is starting around 1:00 in the afternoon. Try a small olive parachute, comparadun or emerger when fishing to risers. Use a size 14 with a size 18 split case BWO as a dropper in between rising pods of fish. Rock Creek and the Stillwater are fishing well on dry flies, too. There are Baetis around, but a size 16 caddis is the best searching pattern. I love Fall on the Stone! Don’t forget to stop and enjoy the Fall colors along the way. It’s spectacular out there right now! Mayfly time is here again! When our nights start getting colder, the hopper bite slows down. 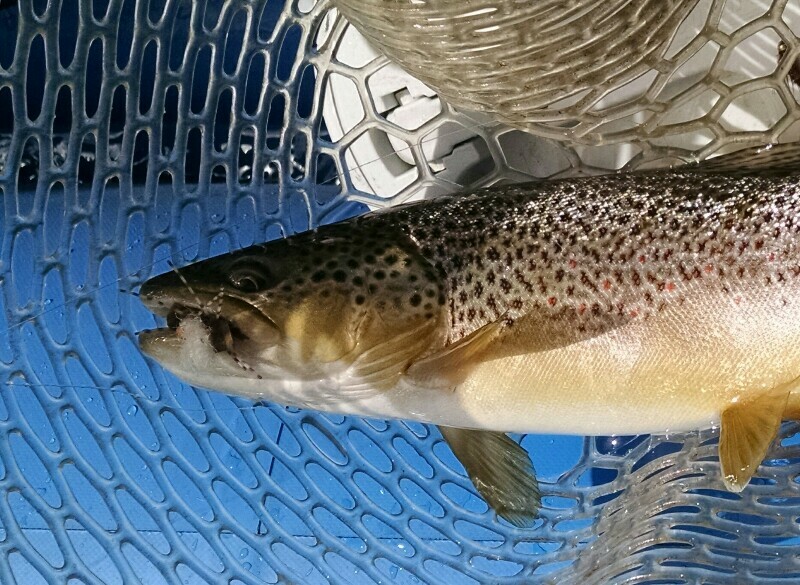 Tricos are hanging in there, but not in big enough numbers to really get the trout interested. Thankfully, along with the cooler weather come the bigger mayflies. Our size 12 yellow duns are out, especially on cloudy days. Trout have started keying on them. A size 12 yellow parachute with a size 16 pheasant tail dropper has been a killer searching rig. If fish are rising, use the yellow parachute with a size 18 purple haze behind it. The beginning of the fall baetis (Blue Winged Olive) hatches is imminent. I have seen a few size 20 BWO’s already. This hatch usually progresses to large numbers of bigger bugs, up to size 16. Be ready with some olive parachutes and comparaduns. Last of the big browns on the hopper this season. Fall is upon us on the Yellowstone! Wow, it’s great to have good flows on the Stillwater this late in the season. I was floating from Johnson’s Bridge (Absaroka Access) to Whitebird up until yesterday. The drop right below the access is getting pretty sketchy, so I’ll probably start putting in at Jeffry’s Landing when I float the Stilly from here on. I expect to be on the Yellowstone for the bulk of my trips through the end of the season. The extended stonefly action this season is transitioning nicely into hoppers. We are starting to get fish on Parahoppers and other grasshopper patterns. The stonefly imitations are continuing to get results. Fish are turning from the bigger nymph patterns to size #14 and down. Pheasant tails, Princes, Montana Princes and other dark colored nymphs are producing the best. There are some yellow spinners around in the morning, with caddis laying eggs all day. If you look hard enough, you will see a fish feeding on top here and there. There are a ton of mayflys of all kinds coming off on Rock Creek and it’s tributaries. Adams, Purple Haze, Parachute Hare’s ear are all working on top. Look for hoppers to start soon! The mountain lakes are fishing well on ants, size 16 Adams, dark Comparaduns and (of course) wooly buggers in black and olive. Try a bugger with a size 14 Prince trailing it. Strip it in with short, quick strips. Here’s a look at some of the action! This 18 inch rainbow came out on a rainy day. 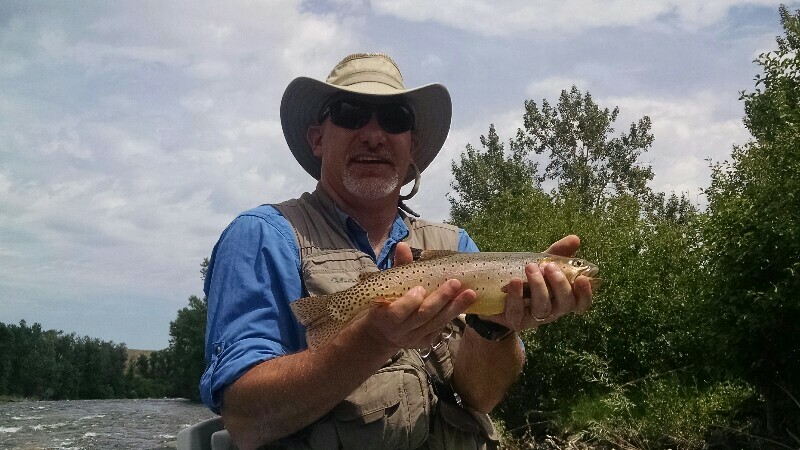 The Yellowstone in the Columbus area has cleared up and is fishing well. Fished Bratten to Twin Bridges yesterday. Trout were eating the Yellowstoner Chubby, Batman Nymphs and Prince Nymphs. The Chubby bite was fair, nymphing was good. The streamer bite was good, as well. There are hoppers around, but stonefly colors were fishing the best. Be careful out there. Flows are still high and the river has changed quite a bit. Lots of trees and debris in the water. Twin Bridges access was totally rearranged. You need four wheel drive to launch a boat. There’s only room for one or two rigs at a time, so prepare to stage in the parking lot and pull down to the river only when ready to launch. When taking out, trailer your boat and pull into the lot to stow things away. It’s already busy out there, so remember your river etiquette. We should be able to wade fish more of the local water this coming week with the flows dropping nicely. Be careful, it’s pretty spicy out there. Stay on the bank and fish the pocket water. A dry fly with a dropper should produce. Try small stimulators, Jack Cabes and PMX’s, size 10 or 12. Drop any beadhead of the hook. Floating the Stillwater is still great! We are moving to the lower sections, below Absarokee now. 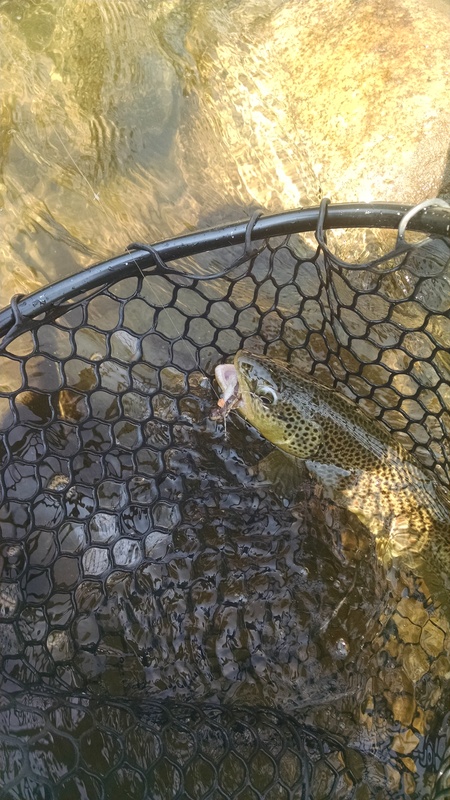 Fish are eating dry flies some days and not some days. Nymphing is consistent. There are several types of bugs around. Mayflies ranging from yellow to dark grey, as well as caddis are popping on cloudy days. This nice pure bred Cutthroat ate a Purple Haze on the Stillwater a few days ago. We always celebrate catching a pure Cutty below Cliff Swallow. There aren’t many left that far from the mountains. Pure bred native Cutthroat on the Stillwater. The Stillwater continues to run high and fish well. Flows dropped to 3000 cfs yesterday. Some of the big rock shelves are starting to fish well with the dropping flows. There are yellow sallies, golden stones and pmds in evidence. Fish are eating a size 10 yellow stimulator well. Size 14 Montana prince nymphs and pheasant tails are working for a dropper. Be sure to use a long dropper line, at least two feet, to get it down deep while the river is still high. Be sure to check quiet eddies for fish rising to pmds. Wade fishing is going to be all but impossible for a while yet. Rock Creek is mostly too high and fast to wade, as are most of the streams in the area. Try the East and West Rosebuds up on the forest service land and Rock Creek just below the Glacier Lake trailhead to find wading water. Stillwater River Finally Coming Down! The Stilly dropped below 4000 CFS today! Float fishing is good, wade fishing won’t be safe or effective for a while yet. Floated Cliff Swallow to Johnson’s today. It’s quite a ride, but the fish are ready to eat. Big stonefly drys, stonefly nymphs and mayfly nymphs all got eaten. Try Yellowstoners, Chubbys and Stimulators in sizes 8 and 10 for dry flies. Girdle bugs, also sizes 8 and 10 got ripped. Montana Prince and traditional Prince nymphs in 14 also worked well. This nice brown hammered a Yellowstoner! 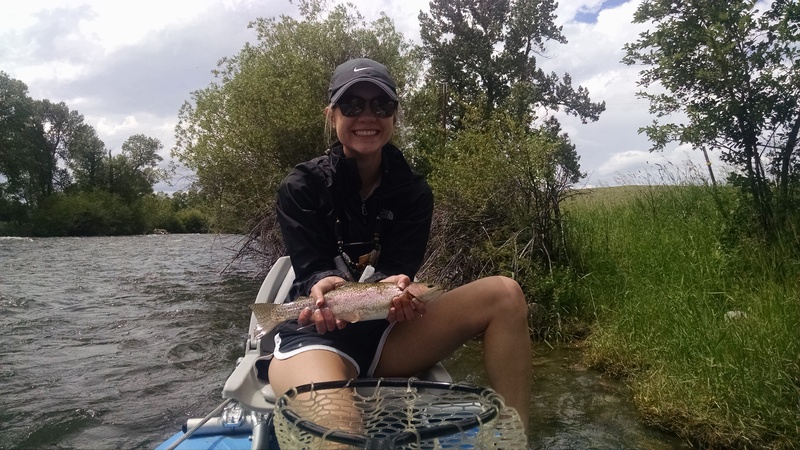 Cecelia’s first fish on the fly! Well, it’s that time of year! Area freestone rivers and streams are full of snowmelt. Probably won’t be fishable until late June, early July. 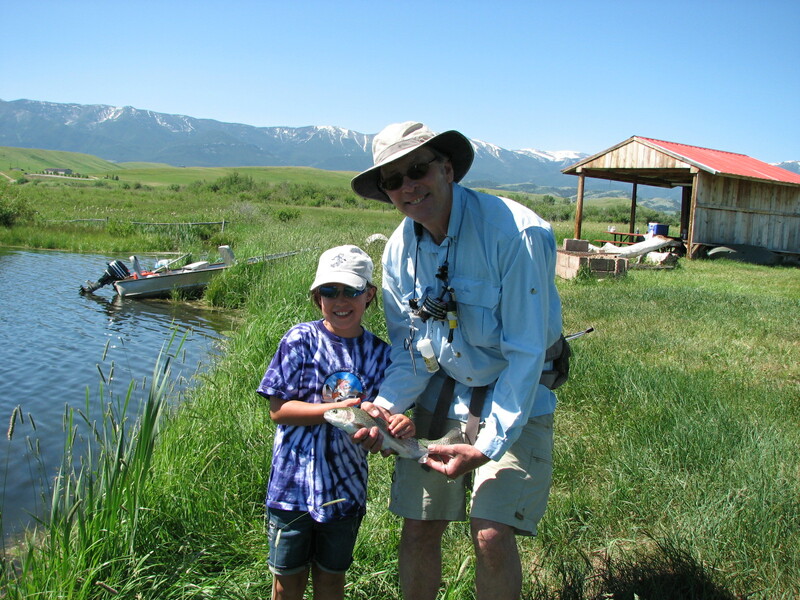 Luckily, the Trout Scout has access to some beautiful lakes in the Beartooth Foothills. Trips start at $295 for two anglers!